This photo features the Minneapolis skyline on a beautiful summer evening. The city was celebrating its Aquatennial Festival, and the fireworks were exploding in the night sky. 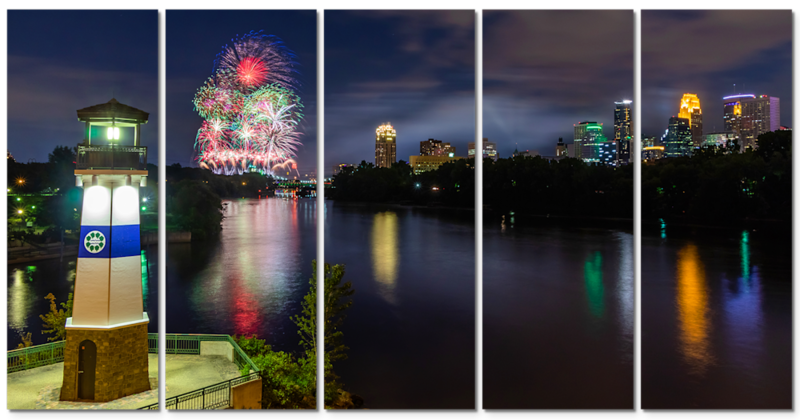 This 5-piece Canvas Wall Art Minneapolis piece named "Aquatennial Fireworks 5" consists of five equal size Canvas Gallery Wrap pieces. The subject is the city of Minneapolis lit up at night while the Aquatennial Festival Fireworks explode over the Mississippi River. The lighthouse is from Boom Island, which is a fantastic park across the river from downtown Minneapolis. I was trying to figure out where to go and photograph the Minneapolis Aquatennial fireworks and was deciding between a few places when an even better idea found its way into my brain. Would Boom Island work if I went up on the bridge where I can include the lighthouse and the Minneapolis skyline? I had just been photographing from there within the past month, so I did a bit of research to see if it would like up with where the fireworks launched from, and everything seemed to line up correctly. So, this is where I went. I arrived on the Johnson St. Bridge two hours before the fireworks started. I had never photographed or even watched the fireworks from this bridge before so I was not sure how early it filled up. I could have easily shown up just one hour early, but I still had a good time there as a couple other photographers that passed through but didn't stay. So I had the place all to myself. When the fireworks started, I was very happy for two reasons. One, the fireworks lined up perfectly! And two, holy cow, these fireworks were AWESOME! Target Corporation sponsor and pay for this fireworks show, and they did not spare any expense. I see the fireworks at Walt Disney World frequently, and these fireworks competed with those Disney fireworks. They were that good! They even had one set that included fireworks that I have never seen anywhere. The fireworks were like floating jellyfish and they'd go up and down. It was crazy! The only bad thing is the battery in my camera died about a third of the way through the show. It was very frustrating as I checked the battery before I left home and it should have easily lasted the entire show. But I did get this image and a few others that will make it here to my website. This image features the Boom Island lighthouse, the Mississippi River, the Minneapolis Aquatenial fireworks, and the Minneapolis skyline. I hope you enjoy my MPLS Skyline Photos, and please feel free to share! 2018 Aquatennial 5 Photograph as Fine Art.